Can You Get Fat From Eating Too Much Fruit? There are many different diet plans to help you reduce your calorie intake in order to lose weight. Instead of purchasing expensive diet products, lose weight by reducing your intake of high-calorie foods, and emphasizing nutrient-dense foods, such as oranges. The healthiest way to lose weight is to work with a nutritionist and your doctor to develop a balanced meal plan with the appropriate number of calories. You can lose weight by eating oranges if they help you lower your overall calorie intake and create a calorie deficit. A calorie deficit occurs when you burn off, or expend, more calories than you eat, and you need a deficit of 3,500 calories in order to lose 1 lb. of body fat, according to the Centers for Disease Control and Prevention. You can lose weight by reducing your food intake, increasing your physical activity or doing both. 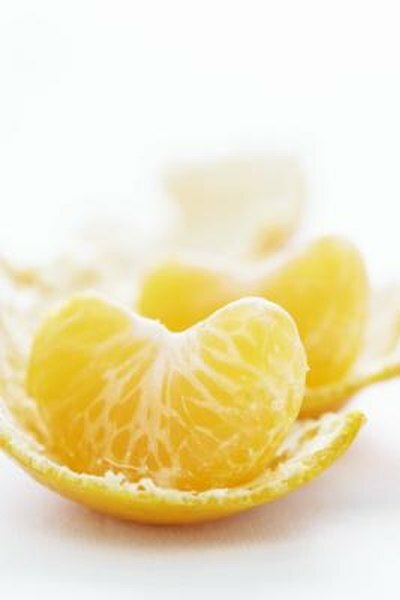 Raw oranges can help you lose weight because they have a low calorie-density, which means that they do not have many calories in a relatively large serving size. A 184 g large orange has only 86 calories. Low-fat foods with a high amount of water and fiber may suppress your hunger so that you eat less, and a large orange is nearly fat-free, and it has 160 g water and 4.4 g dietary fiber, or 18 percent of the daily value. Whole oranges are easy to carry and store, and you can lose weight if you eat them instead of higher-calorie vending machine or convenience store snacks, such as candy bars or potato chips. Their high fiber content can keep you feeling full for longer so that you do not eat as much at the next meal. Oranges can lower your daily calorie intake if you take smaller portions of high-calorie foods, such as ice cream or cookies, and have some raw orange segments on the side. Whole, fresh oranges can help you lose weight, but processed orange products may stall your weight loss. Orange juice is nutritious because it is high in vitamin C, but it provides 117 calories per cup, and liquid calories, such as from juice, are not as filling as calories from solid foods, according to the Orange Juice Facts website. Oranges are low in calories, but having too many calories from any source will slow or reverse your weight loss. Control your portion sizes, and count the calories carefully.